Studiometry Touch 2.0 is a complete rewrite of the app from the ground up. This version adds complete iOS 9 compatibility and a brand new interface, including optimized portrait and landscape orientation support for all device types. Ready for Studiometry Cloud. Studiometry Touch 2.0 can now sync your data with Studiometry Cloud. Studiometry Cloud is a new service that acts as both your syncing backend and your Studiometry licenses. Easily synchronize data between any number of machines and iOS devices without having to set up a server or deal with firewall ports. Studiometry Cloud is a subscription-based service that includes syncing capabilities, native Mac, Windows, and iOS access, as well as partial web access. Track Logs. The popular Logs CRM feature from Studiometry has made its way over to mobile. 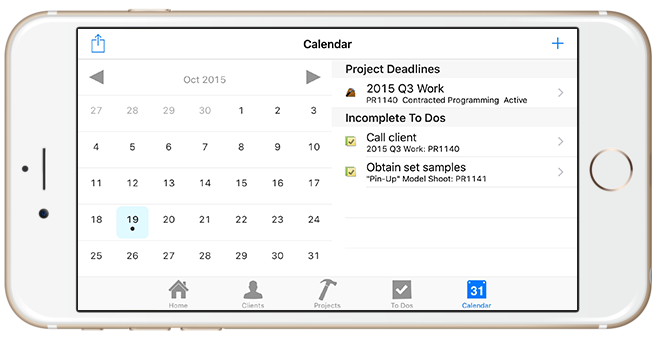 Easily log phone calls, meetings, emails, and more on your mobile device. Studiometry Touch 2.0 can even automatically capture Logs when placing phone calls from the app! More Frequent Updates. Studiometry Touch is now built using the same development tool (Xojo) we use to create Studiometry and Studiometry Cloud. This gives us the ability to share code between our various platforms and save time developing new features. What does this mean for our users? That they will receive much more frequent updates to Studiometry Touch, and that they will see more features from the desktop app make their way to the mobile app. For non-Cloud users wishing to purchase traditional Studiometry licenses, Studiometry Touch costs $39.95/device/year. See the Studiometry Touch FAQ for more information.